Most sequels are never as good as the original. Well I also think this sequel will not be as good as the original, it will be even better! Actually, it's a three-quel. 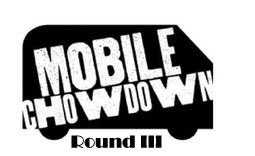 Mobile Chowdown is back for its third installment! Not only will this Chowdown be at a new location and have even more vendors, but it will also include street food vendors from Portland! Portland is well-known for its street food, so I can't wait to sample some of their food. This round will include a showdown between the Seattle vs. Portland vendors. The new location is in SODO district right next to Safeco Field. Parking is FREE at the Safeco Field garage on Edgar Martinez Drive. 103.7 The Mountain will be there from 11pm to 1pm, playing tunes and giving away swag. DJ Joy will perform afterwards. Location: Occidental Ave. S., Between Edgar Martinez Dr. & Massachusetts St. This round of the Mobile Chowdown is sponsored by Seattle Magazine and Suzuki + Chou Communimedia. This will be the biggest chowdown to date! Bring your appetite and sample some of the best food Seattle and Portland has to offer! Chow Down Seattle will be there! Wonderful - LOVE this blog! Love the Chow Downs. I realize you can't rush good food, but I wish lines could be faster. El Camion food is so authentic I think I'm vacationing in Mexico. I suggest that the contest be filmed for the FOOD CHANNEL. Holy crap that was marvellous! My wife had to drag me away like a kid in a toy store. I wanted more of everything! This will be an annual family event for me now. Bravo and thank you!! This was such a better location than out in Interbay, and a much better organized event, LOVED IT! !